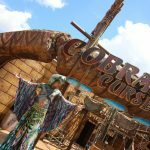 Home Orlando Around Orlando Cobra’s Curse Officially Opens at Busch Gardens Tampa! 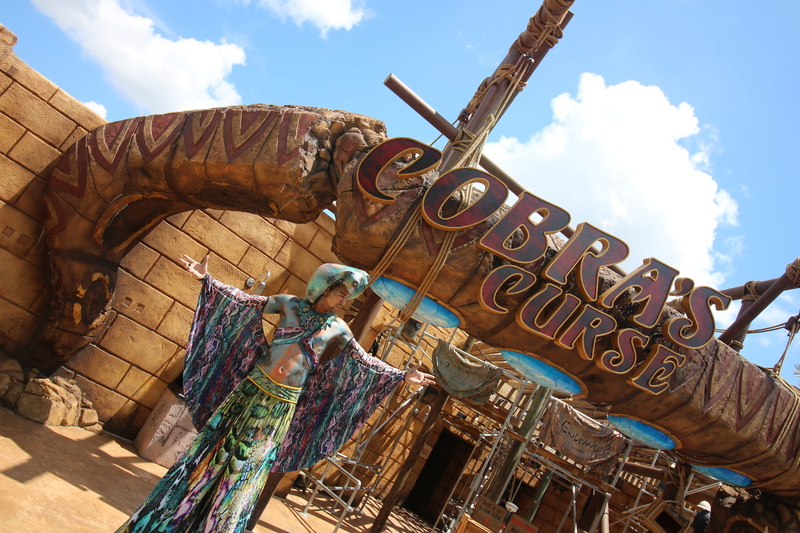 Cobra’s Curse has officially opened at Busch Gardens Tampa, and they were kind enough to invite us out to preview the coaster on Thursday. 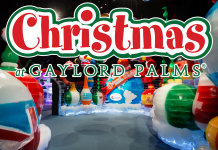 This spin coaster is the only one of its kind in the world, featuring a vertical lift and taking riders on a whirlwind adventure of exciting explorations. Located in the Egypt area of the park, guests will come face-to-face with an 80-foot snake icon, trek over the park’s Serengeti Plain and discover “the mysteries of an Egyptian archaeological excavation”. Following the latest theme park trend, the coaster comes with its own special drink – a new Coke Freestlye flavor called “Cobra’s Twissst”. The taste is very reminiscent of a Raspberry Coke, but not very overpowering with the berry flavor, and very refreshing. It comes in 2 varieties – Regular and diet. In addition to the new coaster, Busch Gardens re-did most of the surrounding area to tie everything together, including a refurbishment to the carnival games located nearby, the locker area, and 2 stores that sell some great Cobra’s Curse and snake-themed merchandise. The queue is simply outstanding. 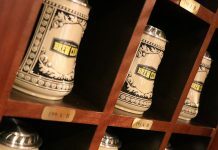 The themeing is well done for the attraction and the story is somewhat-easy to follow – IF you’re paying attention. Most importantly, it’s air conditioned! 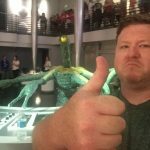 The interior themeing, especially the Snake Chamber and Snake King’s Room, are some of the best queue work that the park has to offer, with even Brian Morrow – VP of Theme Park Experience and Design – singing it’s praises. The Snake Exhibit will be the stand-out addition of the queue. Guests will be just inches away from the 400-cubic-foot snake exhibit which will include Jameson’s mambas, Angolan pythons and rhinoceros and gaboon vipers. The design of the multi-level exhibit not only reflects the theme of the ride, but also features several animal husbandry and enrichment components designed with the snakes’ welfare in mind, including naturalistic design elements, controlled heat sources and humidity control. For those with a fear of snakes, don’t worry – there is a way to by-pass their habitat. While the interior is stellar, there are portions of the outside queue that fall a bit short, mostly due to the minimal themeing and potential for long waits in the hot Florida sun. 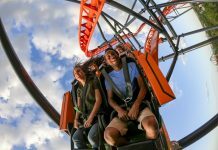 With that said, Busch Gardens has added a great coaster to their line-up, and adding a family-style attraction was the best move for the park. When you take a step back and look at the overall line-up of coasters, its easy to see why they made the decision to bring it here. People love roller coasters and Busch Gardens does roller coasters better than just about anyone else, especially in Florida. The addition of Cobras Curse further cements their stronghold on not just the thrill market, but also helps round out the much needed family market.While this ride may not be as big and fast as Mako down I-4, it may have a greater impact for the park going forward – in terms of family offerings, repeat visits, and better overall guest satisfaction scores.